Returning from India we stopped for a few hours in Abu Dhabi. This airport is a melting pot, which I think is very enriching: you can find so many nationalities, so many ways of dressing and so many different faces. My boys feel very comfortable in such a surrounding. And I hope they will be without prejudice facing other cultures in the future. As a kid I got to know a few Germans in Germany close to the Swiss frontier. They spoke, dressed and behaved like me. This wasn’t rather foreign. When I finished school, all I wanted to do was going abroad. I spent one year in Paris, some month in England and in the States. I always dreamt of living abroad. But I am still in Switzerland. I don’t know why. 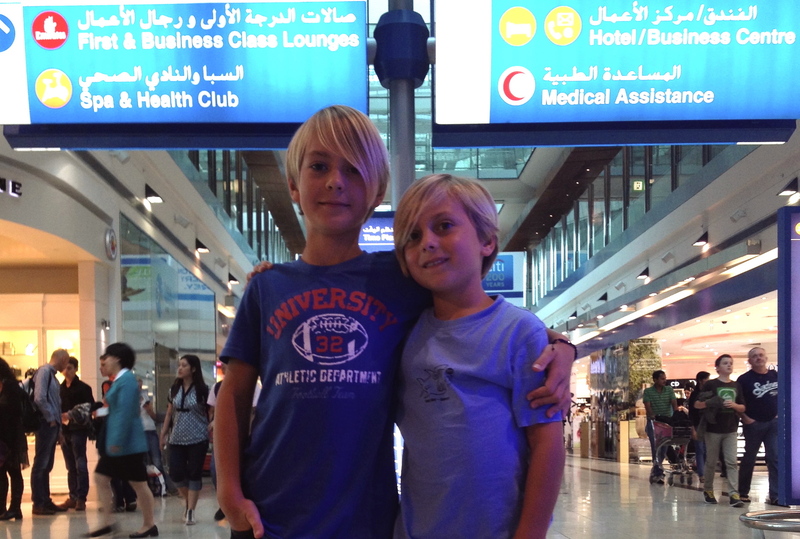 Perhaps it is my task to show my boys how to travel to other countries and to open their minds for other cultures. Maybe… and maybe we will be taking off all three together one day. Who knows? Wow …really … Lot of multi nationalities. How was the india trip? Missing india Kerala …my native. We loved India, Cyril, especially Kerala and we will be going back as soon as possible. How about you? Wow .glad to hear about you loved Kerala. My native is central part of Kerala .Pathanamthitta near by Kottayam. Now mansoon will come end of may …so try to visit lot of good enjoyment you will get it there .boating ,kochi.riding etc. Thank you! I got the theme from WordPress and customized it… easy work!